P R O B L E M : As you emerge from your bath or shower, you want to wrap yourself in a towel that’s much more than just absorbent. Your towel needs to also be warm, soft and luxurious to caress and pamper you as it quickly dries your skin. S O L U T I O N : Treat yourself to the velvety warmth of our snug and cozy Hand and Bath Towels. The luxurious, lightweight, antibacterial microfiber is quite possibly the softest fabric your skin will ever touch. 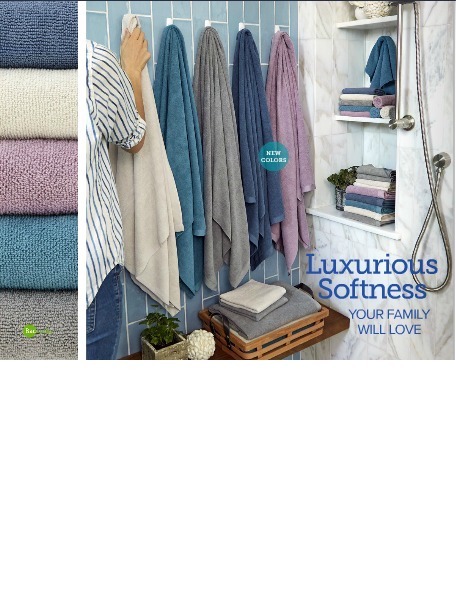 Hand Towel: 70 cm x 35 cm / 27.56" x 13.78"
Bath Towel: 140 cm x 70 cm / 55.12" x 27.56"
• Ultra-gentle microfiber is super soft on sensitive skin. • The micro silver in the cloth goes to work with self-purification properties against the mold, fungi and bacterial odor within 24 hours so that it is ready to use again. • Beautiful vanilla, denim, lavender, teal and graphite colors can be mixed and matched, and they complement any décor. • Rubbing action helps with exfoliation. •Bath Towels have handy loop for hanging. • Use to dry hands, body and hair. • Great at the beach and pool. • When drying, a patting motion is recommended. • Hang to dry after using. • A steaming hot shower might sound wonderful, but warm temperatures are best for your skin. Hot water can deplete your skin’s natural oils, leaving it dry, rough and aky. • Leaving a bit of moisture on your skin after showering can help it not to become too dry, especially if you help lock in that moisture with a good body lotion or moisturizer.